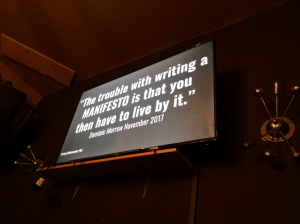 At the March edition of Maker Monday, we were fortunate to welcome two entertaining experts looking at themes including sustainability and the maker movement. Both complementary and yet looking from two very different perspectives on how we can all do better in many ways. 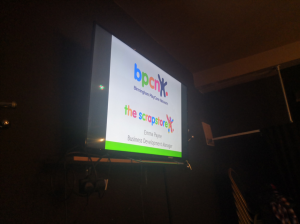 The first speaker this month was Emma Payne, Business Development Manager at the Birmingham Playcare Network who run The Scrapstore Birmingham. 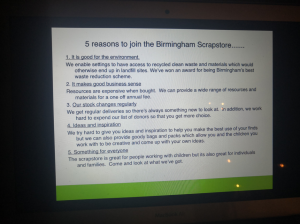 The Scrapstore Birmingham is a charitable resource, based on two sites in the Jewellery Quarter and Yardley. Makers of all ages can tap into it, not just in terms of the materials it has, but also the values to which they espouse. 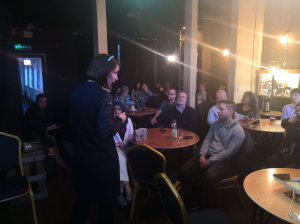 Emma proclaimed that “every little thing makes a difference”, these words forming the basis of her talk as she invited the audience to think bigger. 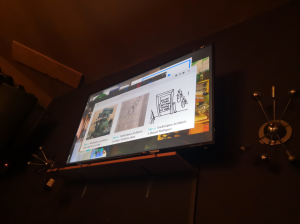 Emma provided some very meaningful context, starting with how they have worked with the NHS, to obtain materials that would hitherto have gone to Landfill rather than being reused. 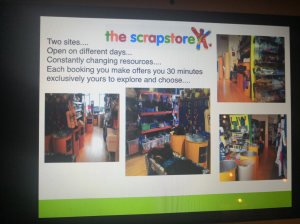 The Scrapstore encouraged them to donate. 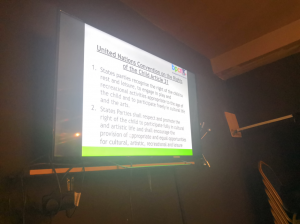 The right of a child to make, play and express themselves is an integral part of the UN Convention on the Rights of the Child. Emma was keen to stress that we are all makers. In the context of an adult audience at Maker Monday, we know that making is, or at least, should be ingrained in life, starting from childhood. Yet whilst in her role at the BPCN, she has noticed that children are much more fearful of going out and making and playing. Emma passed around a moulding for an engine part for the Mini Cooper. In her words, “they are looked after better than a newborn baby” and they have their own packaging parts. It might be part of a huge mural or a badge or a robot’s face, but BMW have a policy to ensure this particular moulding goes to another use. Whilst this might be seen as a big company’s corporate drive towards sustainability, Emma simply pointed out that it is about the mindset – to reuse and to be creative with it. To be a member is to have access to their resources and to be happy in the knowledge of what they are doing is beneficial in so many ways. At this point, audience member Tim said that all of the paint that he uses for his beehives is reclaimed. 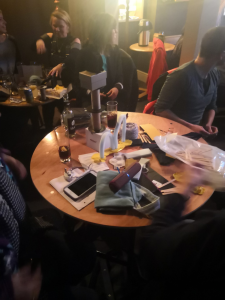 Emma handed out Morsbags filled with reclaimed materials to each table and invited attendees to make something in five minutes. The invitation was duly met and the examples and photos showcase how the crowd rose to the challenge. 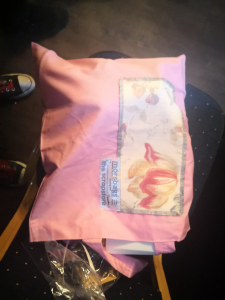 Morsbags is a worldwide initative, encouraging people to make their own bags using scrap fabric. It has to be washable, it has to hold five full bottles of wine. Our compere and occasional wine drinker Mark, approved of this fact. With children and families, BPCN ensure that stuff does not going into the bins. Emma’s take away from her talk is not to throw away but to use it, and use it again. 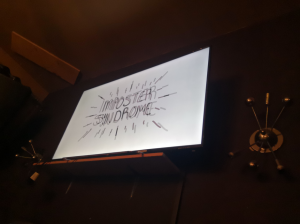 Such an admission is likely to catch anyone off guard but Dominic’s “imposter syndrome” provided the ultimate foil and follow up Emma’s encouragement to make and create. 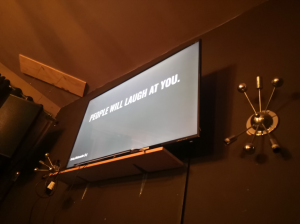 Of course, Dominic’s slight air of self-deprecation belies a couple of truths drawn out very clearly in his talk. Firstly, the maker mentality is alive and well and his blog and social media presence is testament to this. 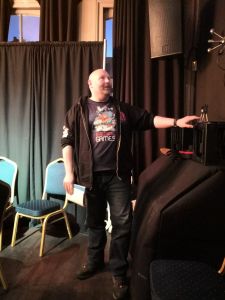 Second, Dominic is passionate about makers, makerspaces, makerfaires and the hackspace movement. It is within this backdrop that Dominic conceived the idea for #makevember based on idea to make something every day and to blog about it. Dominic is someone who likes to come up with ideas, for example, write down ten ideas around the use cardboard boxes, or every day, write down ten ideas of five things you do. The desire to make is a distinctly human one. Specific materials can be comfort zones to enable this desire, whether it is code, a 3D printer or something different. Dominic said that people may laugh at you along the way but serependitous things happen. 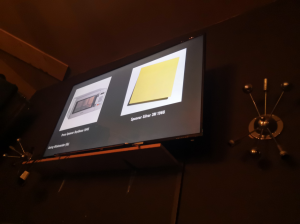 His context is that many of the greatest things have happened as a result, such as the invention of the microwave in 1945 or the post-it note in 1968. 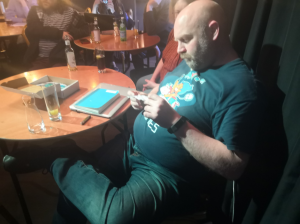 The #makevember community has launched many amazing ideas and he invited the crowd to take up the challenge. Returning to where he began, with his reference to Imposter syndrome, Dominic claimed that if you don’t feel like an imposter, you’re not really pushing yourself to your boundaries. 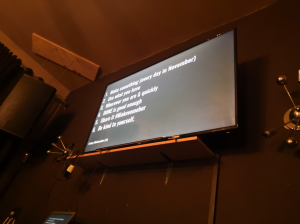 To make one thing, once a day for one month …. Who is up for the challenge? Would you like to present at a future Maker Monday? 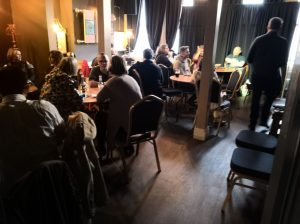 Have you got a great idea for a talk or workshop? Please get in touch by clicking here. The next Maker Monday will be on Monday April 29th at 1000 Trades. You can book your place here. Follow Maker Monday @maker_monday on Twitter.